No. 24 of 100 signed and numbered copies on Dutch hand-made paper. 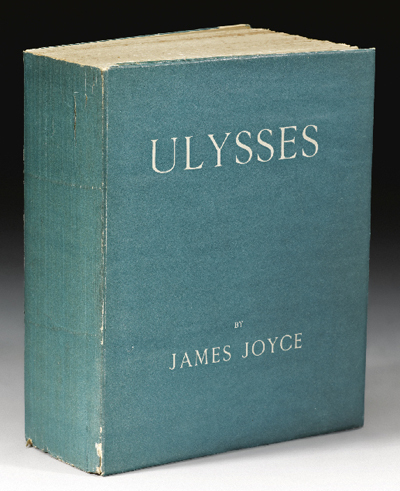 A jaw-dropping and superb Publisher's Presentation Copy of the first edition of James Joyce's Ulysses (1922), number 24 of 100 signed and numbered copies by the author printed on Dutch hand-made paper, is the superstar at Sotheby's-New York Library of an English Bibliophile Sale Part II, October 20, 2011. A volume from rare book heaven and one of a handful of incredible copies of Joyce first editions in this auction, it is estimated to sell for $450,000-$500,000. Tipped-in to this copy is a note-card from Sylvia Beach (1887-1962), key patron, champion, publisher of Joyce, and proprietor of Shakespeare and Company, her famed Paris book shop. The presentation is to St. Louis millionaire and art and book collector, Tudor Wilkinson, who, in 1923, married Kathleen Marie Rose aka Dolores Rose, the most famous of all Ziegfeld Girls, and settled in Paris. 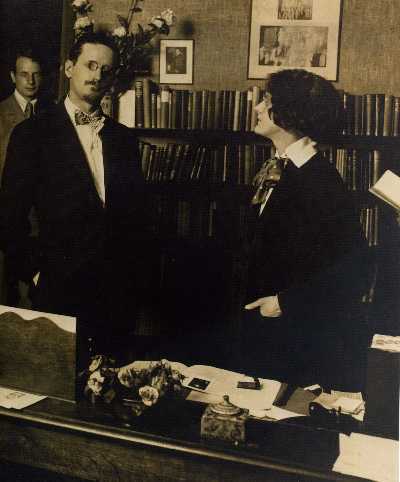 James Joyce and Sylvia Beach, in her Paris office, 1921. This gift to Tudor Wilkinson was in gratitude for his efforts to gain her release from the Nazis. In the late winter of 1941 Beach closed Shakespeare and Company after two threatening visits from German occupation authorities. 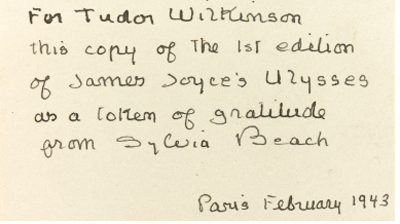 In August 1942 she was arrested and remained interned until February 1943, the date of her note with this copy to Wilkinson, her release largely the result of Wilkinson's letter on her behalf to Jacques Benoist-Mechin, an ardent fan of Joyce who had been a member of Beach's lending library (joining in 1919) but who, at this point, was a secretary at Vichy headquarters. As if the Beach presentation note wasn't not enough, a page from the original typescript with corrections, annotations and revisions in Joyce's hand is also tipped-in to this copy. The typescript leaf is page three from "The Wandering Rocks" episode in the book, which Beach inscribed, "Page of original manuscript of Ulysseys with manuscript / additions by the author." An original print of the black and white photograph above, inscribed by Beach "Shakespeare and Company in the rue Dupuytren 1921 with James Joyce..." is also included with this copy. In 2002, the copy of Long Island, NY commercial real estate developer, book collector, and dog breeder Roger Rechler, inscribed by Joyce to Kenry Kaeser, sold at Christie's-NY for $410,000. The copy under notice, with its powerful association to, and presentation by, the book's famous publisher and a dark episode in her life, the accompanying note, and leaf of original typecript with Joyce's autograph annotations and her inscription should easily reap the low and will likely exceed the high estimate. Despite the recession, the big money for big, trophy first editions remains healthy. 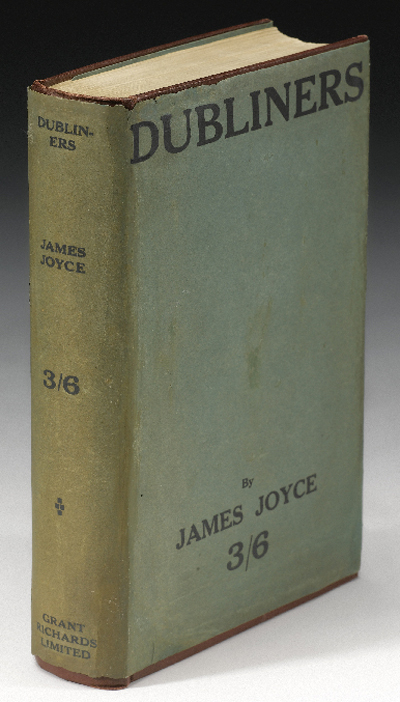 Also offered at this auction is the fine H. Bradely Martin copy in the very rare dust jacket of the first published edition of Joyce's Dubliners (1914), one of only 746 bound copies. A review copy with printed slip requesting that no reviews appear before June 15, it is estimated to sell for $150,000-$200,000. This copy last sold at Sotheby's-NY on April 30, 1990 for $14,000. The inscribed Rechler Copy in dust jacket sold at Christie's-NY on October 11, 2002 for $230,000. The inscribed Kain Copy without dust jacket sold at Sotheby's in 2006 for $137,200. This collection of short stories was originally planned for publication in 1906. But the printers objected to certain passages and refused to print it for the publisher, Grant Richards, who abandoned the book. In 1910, publisher Maunsel printed an edition of 1000 copies. After Joyce refused to make emendations to the text the entire edition was destroyed. Joyce then added two important stories, "A Little Cloud," and "The Dead," to the collection, and in June 1914 Richards - this time using different, less opinionated printers - published the book. 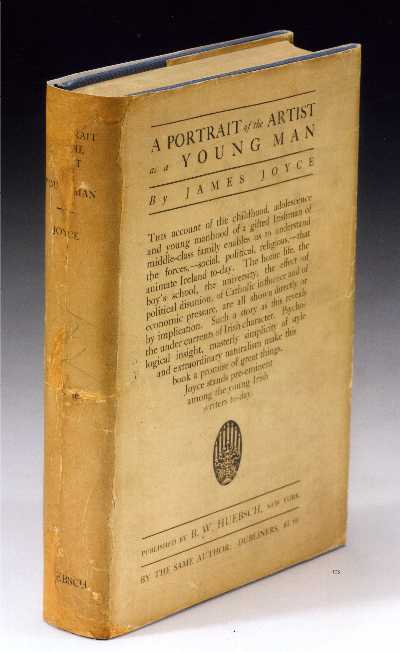 The final big Joyce book in The Library of an English Bibliophile Sale Part II is a fine copy in the rare dust jacket of the first edition of A Portrait of the Artist as a Young Man, Joyce's great autobiographical novel published in New York, on December 29, 1916. The first British edition appeared a month and a half later, on February 12, 1917, using the American sheets because the English printers refused to accept the responsibility for printing it. JOYCE, James. Ulysses. Paris: Shakespeare and Company, 1922. First edition, No. 24 of 100 copies signed and numbered by the author, on Dutch hand-made paper, of a total edition of 1000 copies including 150 numbered-only copies on vergé d'arches paper and 750 numbered-only copies on plain paper. Quarto. Printed wrappers. This copy unopened. The story of Wilkinson and Beach can be found in a series of unpublished letters by Wilkinson to the poet and bookseller Adrienne Monnier held at the Ransom Humanities Research Center at the University of Texas. Slocum and Calhoon A17. Connolly, The Modern Movement 42. JOYCE, James. Dubliners. London: Grant Richards Ltd., . First edition., one of only 746 bound copies. Octavo. Publisher's maroon cloth. Dust jacket. Bookplate of H. Bradley Martin. JOYCE, James. A Portrait of the Artist as a Young Man. New York: B.W. Huebsch, 1916. First edition, preceding the first U.K. edition. Octavo. Publisher's cloth. Dust jacket. Slocum and Calhoon A11. Connolly, The Modern Movement 26. All images courtesy of Sotheby's, with our thanks. • The $175,000 Dust Jacket Comes to Auction. • Scarce Poe First Editions Exhumed From Premature Burial at Sotheby's Sale.